Hey, that's what it is all about, one small step at a time. Sooner than you know it you will hitting the ground running. Hey all! Well i had another great weekend with diago. He has been so good for me lately. Im so excited. I've been doing alot of ground work with him, and i think i've finally gotten over alot of my fears with him. I rode him for probably about 30 minutes saturday. The longest i've been on him at one time. And he did wonderful. He moved when i told him too. which is a big improvement. I think that i have finally learned how to relax in the saddle. We started to trot for about a half a second until i realized i just wasnt ready for that yet. 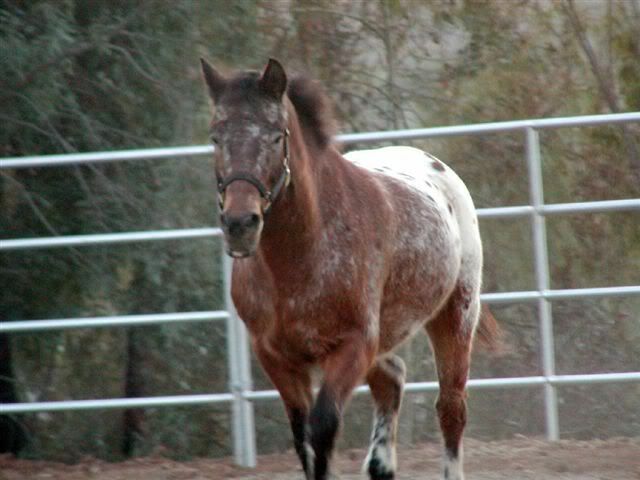 Him being a quarter horse his trot i guess is not as smooth as a gaited horse. But as far as fears, their is almost none. and i am very happy with my choice in purchasing him. He has come so far with how he behaves and his manners than that with his previous owners. So all is well and i will post some pics soon. Thanks everyone for all the great advice. And also that ehow website makes wonderful reading , i am learning so much by just reading everything i can get too about horses. Will post more later. Great job, lil bit! I think it sometimes takes a long time to get started but once you do, progress goes faster. Keep us posted & hurry up with those pictures! "My treasures do not sparkle or glitter, they shine in the sun and neigh in the night." Keep up the progress. We're with you. i hope i did this right. But here is a pic of my baby! Hey lil bit, I like the looks of your horse. Nice and well behaved for the photo. How has your progress been coming along? Done anymore riding lately? Good job on posting the pic, lil bit . Nice looking gelding, too . We have had a mad case of the flu for like the last 2weeks. So riding has been scarce. We did however mangage to get on him this weekend and i believe he has been feeling neglected because boy was he a booger. But after 10-15min. He straightened up and was his usual well behaved self. He was acting too bad for me to get on him. lol.. But im a baby. He can be just a little rowdy and i wont get on him. He has to be in a real good mood for me. You are doing good but keep working on the confidence issue. I know of a horse that developed a very bad habit of not letting anyone mount him. He was taught this behavior because whenever he would act up the rider wouldn't get on his back. So the horse quickly learned that if I act up than I get my way and I won't have to go out and "work." This horse will continue to try you until you establish that you are the one in charge. Thanks for the update though. 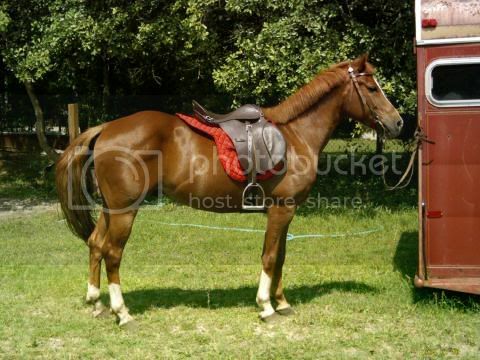 Nice looking well muscled 3 year old quarter horse. Great picture. LIke the shine and the mane also looks great. I would like to suggest that you do not use the reins to tie him. If he spooks he would probably break your reins and worse case injure his mouth badly. I never use the reins to tie a horse. A halter is much preferred. I didnt think about the reins hurting his mouth if he spooks. This picture was taken of him the day before the previous owners brought him to me. We have only tied him up one time and that was for a bath. He spooked broke his rope and fell on the concrete. So we dont tie him up anymore. He has always stood still for the farrier and tacking him. But it is good to know that you shouldnt tie him by the reins. I will tell his previous owner for her new horses safety. And thank everyone on the compliments. He is are first so i was hoping that i got a good one. He just turned 6 this november. He does really good on the mounting part he dont move at all. I just dont have a firm hand with him. He doesnt give my husband problem at all. I am getting better just moving at a much slower pace than everyone else getting over my fears. Gorgeous! Looks like he is well cared for...lot of shine!